Do you think I could make this in a 10″ cast iron skillet? Thank you! Hi Janet – yes, that should work fine. You may have to reduce the cook time. I just tried this recipe as written except did not grease the pan with the extra 2 tablespoons of butter. I coated the bottom of the cast iron skillet with a thin layer of butter. The cookie baked up just fine with crispy and chewy edges. That extra butter is not necessary for success. It is delicious! So glad you enjoyed it. Thanks for the tip. Just had to tell you that this is absolutely fantastic!!! I am a baker, and a very picky baker. 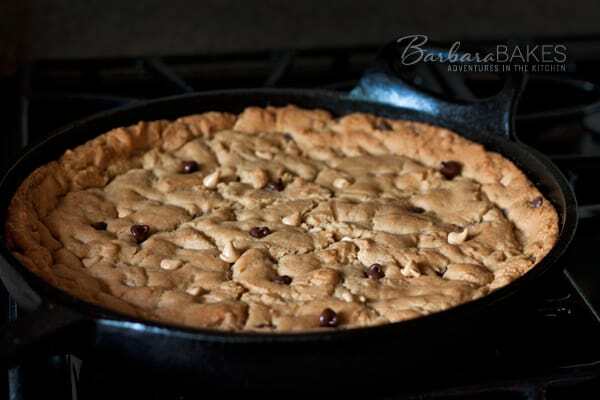 I doubled this recipe and baked it in a 12″ skillet, and it was the best cookie I have had in years. Can’t wait to try more of your recipes! Thanks Kelley! My daughter is addicted to the skookie. 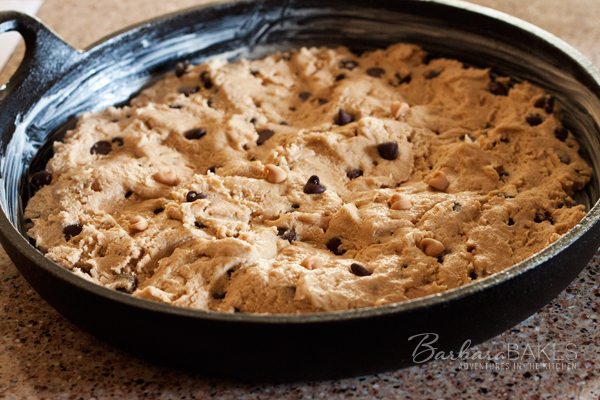 Barbara, thank you for this wonderful recipe. It’s one of the best new recipes I’ve found in a long time. Tip for others who don’t have a skillet: I used a ceramic pie pan and it turned out perfect!! What a great tip. I’ll have to try using a ceramic pie pan. Thanks! Yum, this looks so good and I love that it uses a cast iron skillet! What a beautiful skookie! 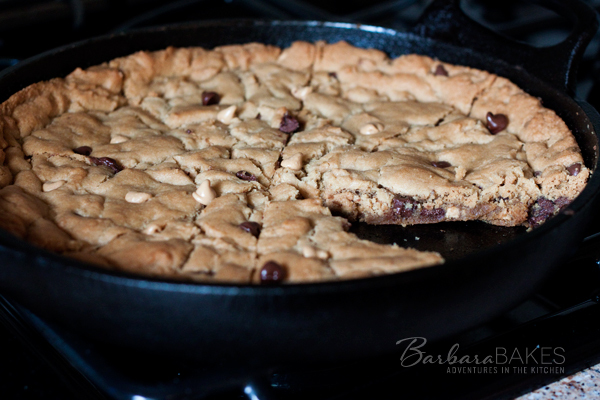 I don’t know why cooking desserts in a skillet always makes it taste so much better, but it does. Great looking cookie, love the peanut butter! What a perfectly done skookie! I’ve always wanted to make one but at the same time, very afraid that I’ll eat the whole thing before I kids get home to share! hahaha…Okay, maybe I should make one on the weekend so they are home to help out, just to be safe. 🙂 Wish you a happy Friday and a beautiful weekend ahead. I came by looking for a dessert to make for my son tonight and here it is! I can always count on you!! I would seriously be tempted to eat this whole thing myself!